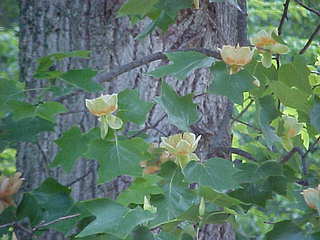 Solved: Tulip Poplar in Tree, Plant and Wood I.D. Honeybees are a pollinator, but they are european imports. To my knowledge the native pollinator is unknown. Thanks for the info. I have also been out of the loop for a while. Busy with "real job" and milling when I can. I got the info I need on Tulop Poplar span tables from a friend. ANd yes, this is an Ag use building, thats what my permit says, and that's all it will be! Amazing how difficult it is to use non-graded lumber without jumping through hoops like this! Even if the quality is better than any of the crap you have to pay good money for. I've been typing this up while out on site-offline...I see bjorn already found it but figured it might be worthwhile info for someone in the future. The book lists spans based on Fb and E and then goes on to give those values for quite a few species...a real good table to get hold of for those who might need something other than run of the (Canadian ) mill info. These are the design values for joists and rafters from the "92 CABO codebook NC Edition. That's all very helpful information. I appreciate the effort. This information does not seem to be readily available on the internet. A name I've heard given to several trees, this is ours. Hey Mitchell, you dug up an old thread I had forgotten about . Whereabouts are you, I'm in Grayson County. Poplar was the main clapboard siding wood here in the past, most I've measured seems to be 5/8x6" in that style. It would be fine for board and batten. I like ~10" wide with ~3" battens but the wider you go the more cupping gets to be an issue between sawing and hanging it. Board and board is another popular style, for 6 and 8", the 8" boards would be on the back layer spaced 4" apart by using small 4" x framing width and siding thickness blocks, then the 6" would go on the outer layer overlapping the 8's by an inch on each side so in the finished product it all looks like 6". I usually borate poplar, powderpost beetles like the sapwood. This is a pic of how I like to do the bottom of B&B, this is hemlock but could be poplar, I do like being further above grade! The bottom horizontal board has a 15 degree bevel ripped on its top edge and the boards have a 15* on their bottoms then the battens extend to the bottom of that horizontal board. This blocks the critter crack and helps shed any water that tries to creep into that joint.